It's peak strawberry season which means strawberry shortcake, milkshakes, ice cream, parfaits, pies, and muffins. It also means it's time for strawberry cardamom crumb cake. This cake has a deliciously old-fashioned feel to it -- like the cake your grandma would make for dessert after Sunday supper. The crumbly, sweet topping gives way to a fluffy, moist cake laced with spicy cardamom and punctuated with juicy strawberry pieces. It's the ideal cake for visiting, Sunday brunch, or afternoon tea. So don't let strawberry season pass you by without baking this strawberry and cardamom crumb cake. After all, you don't want to disappoint Grandma. Place rack in center of oven and preheat to 350 degrees F. Butter or coat with cooking spray an 8 inch square pan. To make the crumb topping, in a small bowl combine flour, sugar, salt, cardamom and pecans, and toss until well combined. Pour melted butter evenly over mixture, and using your fingers quickly toss and pinch the mixture until little pebbly pieces form. Refrigerate while making the cake. In a large bowl, combine flours, baking soda, salt, and cardamom. In another large bowl, using an electric hand mixer cream the butter and sugar. Add eggs, lemon zest, and vanilla, and beat at medium speed until light. Reduce speed to low, and add the buttermilk. Beat until well blended. Add the dry ingredients; beat until just incorporated and the flour is dissolved. The batter will be thick and creamy. Using a rubber spatula, fold in the sliced strawberries. Pour the batter into the pan and gently shake it to even it out. Sprinkle the crumb topping evenly over the top of the cake, and press lightly with your hands. Bake for 35 - 45 minutes, or until the cake is golden brown and a cake tester inserted deep into the center comes out clean. Transfer the cake to a rack and cool for 10 minutes before unmolding onto the rack to cool at room temperature. Unmold the cake, and place on a rack. Allow to set for 15 minutes before slicing. P.S. Congratulations to two Food Blogga give-away winners: Clever Karen won dinner for two at Carraba's, and Cheryl won two tasty books. And thank you to Lydia of The Perfect Pantry. I won a vegetarian cookbook on her give-away. Srawberries ar eone of my fav fruit and this cake is in my must bake list. I haven't used cardamom in a long time and I really love the flavor. I bet it was great with the strawberries! Wonderful flavors of strawberry and cardamon, the cake is surely a must bake for me too!! Looks good. The topping almost reminds me of those strawberry shortcake ice cream bars. You are definitely correct a must bake!! I just adore strawberries and with Cardamom running through it must taste amazing! Yum what a gorgeous moist little cake! Love the crumb topping. Even though I know I would use almonds not pecans on the topping, I know I would love this ... my grandmother would have too. She made cakes like this with nut toppings, I don't remember strawberry as part of the equation but she sure like them. karen-I was surprised at how well those flavors got along. parita-It really is a "must bake," so I hope you do! kara-Great! You won't be disappointed! ramona-Oh, yeah! I hadn't thought of that, but now that you mention it, it does! tanna-I have had good luck baking with strawberries, and it's a nice twist. Almonds work well too. sues-Then it's double happiness cake! I love the cardamom/strawberry combo! I bet it is heavenly! This looks amazingly good!! Can't wait to try it! This is a lucious looking crumb cake and I like the pecans added in the topping! Wish I had a piece, or 2, right now! Your cake looks delicious. Lovely photos. That does look delicious. I recently made Mango Cardamom Scones that were amazing! I love cardamom- it's a very underappreciated spice! This sounds so delicious! When I first saw the picture, I admit it reminded me of those strawberry shortcake good humor bars...which are my weakness, by the way. Love cardamom. I just made some fig/pecan muffins with it! These are lovely photos! And I bet this taste wonderful..
Cardamom is hands-down my favorite spice. I put it in most of my baked goods, my morning tea, and whatever else I can think of. If they made cardamom perfume, I'd buy it in a heartbeat. Your crumb cake looks lovely. 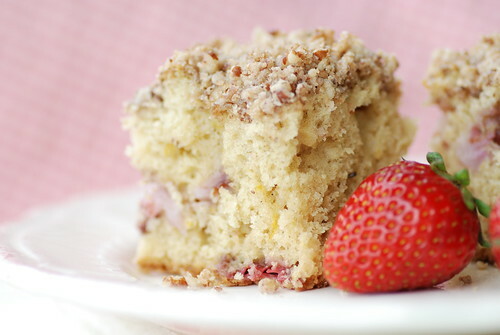 I havent had strawberries in a crumb cake like this before, just muffins! And the cardamon is such a pleasant addition! Isn't it a glorious season? And what a wonderful combination of strawberries and cardamom - that mix of sweet and mysterious spice sounds fantastic! Cardamom is wonderful in sweet uses and hey...lots of local strawberries in the markets now...off I go! Thanks for reminding us how well cardamom and strawberries go together. It's a wonderful combination of sweet and "warm", yet I often forget about it. This cake looks wonderful, Susan! Although, I doubt my grandma would've ever made it. She probably never even heard of cardamom! ;) Good thing I have! I am always so afraid of baking with strawberries - I have this feeling they have too much water and that would ruin the dough/batter. But seeing this lovely piece of cake is making me change my mind! That cake looks so moist and perfect! My oldest would devour it! Do I measure the 1 cup of strawberries before or after slicing? I have a half-flat from a local farmer that I've been savoring and this looks like a great way to use up the last bit! What a lovely cake, perfect for this time of the year! snooky-The flavors are beautiful together. elly-Fig/pecan muffins with cardamom? Oh, now there's another recipe I NEED to get! jennifer-You'll love the cake then. lydia-How nicely said. Thank you. susan-More the crumb topping, ya know? patricia-I have had good luck baking with strawberries. Give it a try! tw-It makes strawberries seems exotic, doesn't it? annelise-I appreciate that. Thank you. patsy-Hope you try it then! mallory-After slicing. Hope you enjoy it! 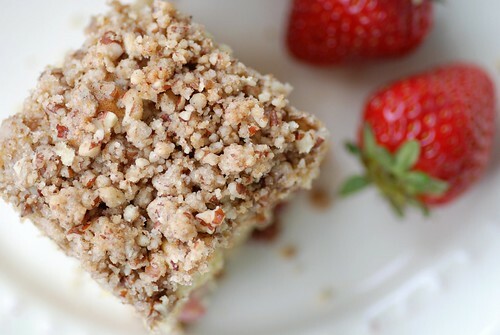 We have just added your latest post "Strawberry and Cardamon Crumb Cake Recipe" to our Food Directory . You can check the inclusion of the post here . We are delighted to invite you to submit all your future posts to the directory for getting a huge base of visitors to your website and gaining a valuable backlink to your site. Mmmmmm. Crumb cake!! Once I eat enough local strawberries to feel really full, I'll start baking strawberry cakes. (PS Season is still about a fortnight away here).. This is one beautiful crumb cake. I am truly a coffee cake/crumb cake girl and this one is a must do. What a lovely crumb cake! I'm finding so many delicious strawberry recipes I'm afraid I'll run out of time to bake them all before the season ends. Looks awesome. I'm loving all of the seasonal recipes I see. I still have leftover butter milk to use up. More inspiration. This morning I went a bit nuts and now I'm sitting in front of two giant buckets of beautiful and fragrant strawberries. I had to rush back here to grab your recipe and it'll be the first thing I make tonight with my loot. I have failed baking a strawberry cake:-( This looks really pretty. really like the use of cardamom here. I'm just starting to get strawberries from my garden and am looking for ways to use them. This sounds delicious!! Oooh. This is making me hungry...looks and sounds delicious! What an amazing crumb topping on that cake! Lovely! this dessert must taste fabulous!!! Love the addition of cardamom together with the strawberries!